San Polo in Chianti occupies a pleasant location between Monte Masso (m.467) and Monte Muro (m.634). The village is famous in particular for its centuries-old iris farming which extends as far as Poggio alla Croce, Reggello and many other villages in Tuscany. An International Iris Festival is held at San Polo each May. The iris rhizomes are exported all over the world and used in the manufacture of perfumes and cosmetics. 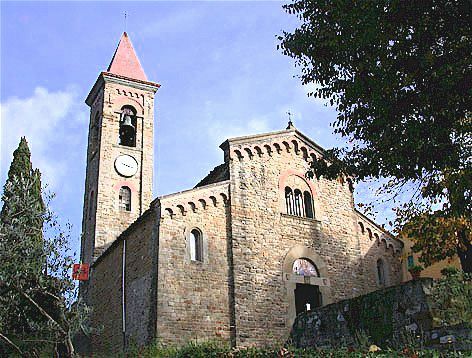 The parish church of San Miniato in Rubbiana contains an old Gothic inscription commemorating the consecration of the church in 1077. San Polo is within easy reach of Florence by car or bus. San Polo can easily be reached from Florence by turning off the Via Chiantigiana at Grassina. The road eventually meets up with the Arno Valley. The San Polo bus stop serves the Florence city bus line (ATAF, Number 49) and the pullman service (SITA) to Florence and Greve. In about an hour you can reach Siena, Lucca, Pisa, Arezzo or San Gimignano by car. The small centres of Greve, Panzano and Castellina in Chianti can be reached by car in less than half an hour. Click here for vacation accommodation near San Polo. Ecclesiae et ab Episcopo Faesulanensis nomine Guulgelmone. Christus in hac aula sit custos iure sacrata. The church is divided into a nave and two aisles separated by three unequal spans supported by square pilasters but at the presbytery the three parts become a single hall. The building shows the modifications made in the early 19 C, which include the false dome and various internal furnishings. The remodeling in the neo-Romanesque style of the early 20 C is also apparent in the bell tower and most of the façade. Externally, the original Romanesque walls of sandstone courses are visible on the right side of the church and in the semicircular apse. Romanesque windows, now sealed up, are exposed in the upper walls of the nave. Questo è il sito sul web di San Polo in Chianti e delle aree circostanti della Toscana. Cliccate qui per fare pubblicità su questo sito. Copyright © ammonet InfoTech 2003 - 2019. All rights reserved.